Ride Company and Bill Tracy of Amusement Display. Their masterpiece: the former Le Cachot dark ride at Kennywood Park in West Mifflin, Pennsylvania. Arguably, it was the ultimate classic dark ride. In reality, Cassidy and Tracy didn't work together on Le Cachot when it was created in 1972. 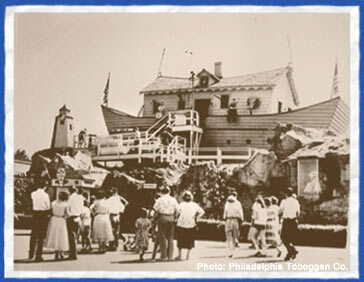 Cassidy had designed and manufactured a Pretzel dark ride for Kennywood in 1954. It employed a fleet of Pretzel's new spinning cars that took the industry by storm in the mid-1950s. Nearly 20 years later, when Tracy was commissioned, to retheme it to Le Cachot (English translation: The Dungeon), he retained the Pretzel fleet as well as Cassidy's disorienting track configuration. With Tracy's fiendish boxed in stunts and Casey's winding S-curves, it was a purist's fantasy come true. Perhaps it was fitting that these two geniuses collaborated after the fact, since decades earlier, Tracy worked for Cassidy as an artisan. Confused? Okay, let's start at the beginning. 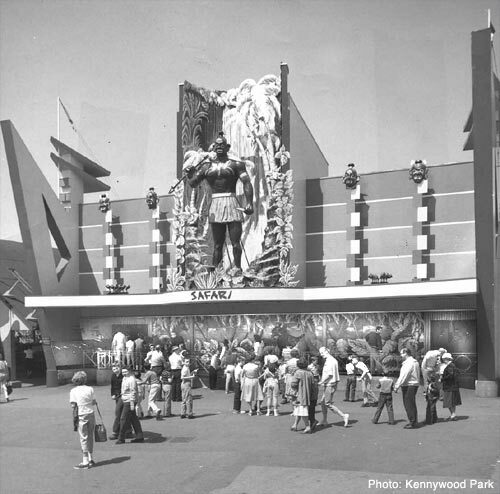 In 1954, Kennywood already had four dark attractions: a Harry Traver-built Laff In The Dark, a Noah's Ark fun house, a Daffy Club almost certainly built by PTC, and an Old Mill. So what prompted the park to add a Pretzel dark ride? recalled his 1954 visit to Kennywood. "It was a grand old park with nice people running it," Cassidy said. Like he had done for many previous Pretzel installations, Cassidy laid out his track and stunts in a previously used building. Kennywood selected a structure that had debuted as a bowling alley; then housed the Cuddle Up ride. As Hughes recalled during a recent interview with Laff In The Dark, the Pretzel came with the standard set of black box stunts that were "track activated, mostly." (One of the most popular black box Pretzel stunts of that time was "Bull" - a stunt still active in Sylvan Beach's LaffLand. So, Kennywood's Pretzel had its track, cars, stunts and façade. But it had no name. A cross-promotional contest with a local kid's TV show, "Ida Mae & Happy" produced the winning name "Zoomerang," probably inspired by the winding curves and the 360-degree spinning of the cars. Sadly, the Zoomerang cars only spun for one season. Kennywood followed the lead of many parks throughout the country and deadbolted the spinning mechanism. "It was the easy way out for the maintenance staff," recalls Hughes. However, a locked Pretzel spinner on a winding track still makes for a disorientating ride. With the car's high back design and its sideways movement, the rider cannot see what lies in front or in back; only what's coming over his or her right shoulder. Even without the spinning, the elements of surprise and confusion are prevalent. 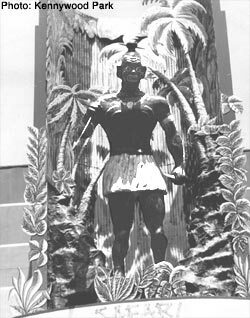 Tracy also designed the façade for his creation, "Safari," installing a 16-foot tall African warrior over the loading platform. The warrior said "some mumbo jumbo" according to Hughes. "Bill Tracy had a theory that the budget for new dark ride scenery should be one-half stunts, one-half front," says Hughes. "This was in the days when everyone used tickets, not POP (Pay One Price)." In 1972, Kennywood decided to round up the jungle animals and clear the brush for a third rendition for its Pretzel ride. Once again the park handed the reins to Tracy who turned the Pretzel into the dungeon of a sinister medieval castle. About 10 years earlier, Tracy had designed another spooky castle, "The Castle of Terror," at Rocky Point Park in Warwick, Rhode Island. In his Castle of Terror, Tracy pushed the envelope of political incorrectness with large, graphic dioramas that often included politically incorrect stunts. Perhaps he mellowed a bit over the years, because his Le Cachot creation for Kennywood was light on the grotesque and heavy on timing and lighting effects. The stunts were positioned perfectly to take full advantage of the riders' limited range of vision in the sidewinding Pretzel cars. The stunts, most encased in black boxes, seemingly appeared out of nowhere. It was one jolt after another.